After last year’s sell out show, the annual Peace One Day concert is set to rock the Royal Albert Hall in London. This year’s concert will see performances from Annie Lennox, Bryan Adams, and a guest appearance from Jude Law. 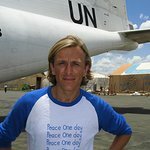 There will also be a gala screening of The Day After Peace, the acclaimed new documentary film made by Jeremy Gilley. The film, which received a great reception at its premiere during the 61st Cannes Film Festival, features Kofi Annan, The Dalai Lama, Angelina Jolie, Jude Law, Annie Lennox and Jonny Lee Miller. The 2007 concert featured acts such as Corinne Bailey Rae, Kate Nash, James Morrison, and Yusuf, with video segments from David Beckham and the Dalai Lama. Tickets to the 2008 Peace Day Concert can be bought from Ticketmaster, and cost between £35 and £55.